We developed this apron out of necessity. We call it our CUTTER’S apron as it was made initially to wear when cutting our jeans. Most clothing cutters make an apron out of some scrap laying around the workshop in order to protect their trousers from the constant rubbing against the cutting table edge. Naturally, as we work in denim – ours is made from the stuff. This is the ideal material for the job as it’s really hard wearing. 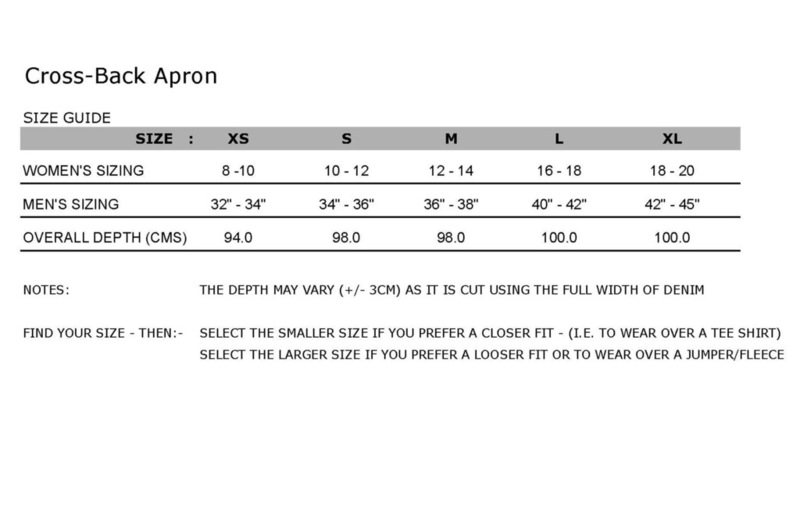 This apron has two big pockets on the front with an additional pocket tucked inside the right hand one (we find this useful for easy access to pens etc.). There is also a loop on the left-hand side that we use for trimming shears. Cut from the full width of the denim it has a selvedge edge on each side. The 1” brass eyelets are tied with cotton herringbone tape. The apron comes with contrast ties made in our signature red to match the colour of the bartacks. Available in either 10oz or 12oz (shown) weight denim.